The More, The Messier: Snow! It's snowing here, enough for the local schools to close down. There are 4 teens in my dining room, playing Texas Hold 'Em. There are 5 more kids in the kitchen, making hamantaschen, drinking hot cocoa, and eating popcorn. Last I checked, I only birthed 6 kids, and 2 of those don't even live here anymore. So...where does that leave me? 5 extra kids? I can't figure it out. Me? I'm experiencing the miserable part of my cold, sitting on the couch, hugging my box of Kleenex, and sucking on Ricola throat drops. Very attractive. Larry is sitting opposite me, trying to pretend that I still look like the girl he married while he messes around with his new Internet radio. He has tried to explain this device to me, but every time he starts throwing around words like "Bluetooth capability" and "wireless speakers," I feel like that dog in the Far Side cartoon - you know, the one whose owner is talking and all the dog hears is "Blah, blah, blah, Ginger. Blah, blah. Blah, blah, blah, blah, Ginger!" That's all, folks. It's a winter wonderland out there, and I hope it keeps up all day. I also hope no one expects dinner, because I didn't plan any. Nada. Zilch. Sounds like all those kids better know how to cook - or at least how to order take out! I feel like Ginger the Dog when my husband tries to explain sciencey things to me. The Youth Scene at your house sounds great! And I would take hamentaschen for dinner any day. They look really yummy. 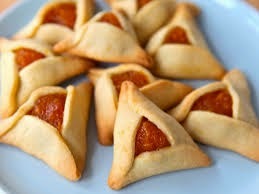 I can't think of what to make for dinner either, and we already ate our hamentaschen. I like the sound of the fun at your house!